Can you remember? Those were the days of carefree motoring: stepping on the accelerator pedal, the wind in your hair, and ‘Born to be Wild’ blaring out over the radio. Today, mobility is more important than ever, as transport of people and goods drives prosperity and growth. Yet our romantic attitude to motoring has developed into a pronounced environmental awareness, and exhaust emissions from all kinds of vehicles is the challenge we have to face. For several years, legislative initiatives have been in place: in Europe we recognize Euro 6, but other countries have also realized the need to reduce emissions and are acting accordingly. India is a good example, and is taking a big step in a very short time to meet an emissions level which is similar to Euro 6. For new cars, the BS VI standard will take effect from the start of 2020. Future challenges lie primarily with sensors and electronic systems like accelerator pedals and hand throttles. The constant reduction of limits for exhaust emissions needs increasingly accurate electronic signals and their execution in vehicles within milliseconds. Only if this complex interaction is performed in perfect synchrony, will vehicles be able to reduce fuel consumption and be more efficient, and therefore better for our environment. For more than three decades, AB Elektronik has been a proven design partner for pioneering solutions, exemplified by its optimized portfolio of accelerator pedals. The European Competence Center at Werne an der Lippe, Germany, takes the lead in product and process design for these products, which are transferred for local manufacturing around the Group. The accelerator pedal is a direct communications interface with the driver, and an integrated sensor is used for continuous capture of the pedal-plate position. 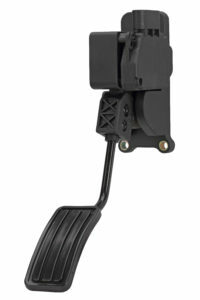 In an electronic hand-throttle, a sensor detects the position of the handle. This information is transferred from the sensor to the control unit very quickly and accurately. The control unit communicates with an actuator at the throttle-flap, which will open or close according to the sensor signal. A complex process chain follows and will influence engine management, and via special control units, will also communicate with the ESC and ASR for example. In addition to ensuring efficiency, several features are provided for safety and comfort, which will be driven from the signals of the very same sensor in the accelerator pedal or hand-throttle. The complexity of these processes, which all depend on this one sensor signal, create a need for technologies that are precisely designed for the individual needs of each customer application. Recognition that the complex process chain, mentioned above, needs to be driven electronically, led AB Elektronik to introduce an electronic accelerator pedal for “Drive by Wire” solutions in 1998 – one of the first companies to do so. Today, more and more car manufacturers are using this kind of pedal, and the traditional Bowden wires will soon be no more. 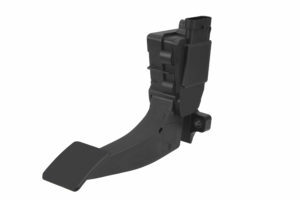 Position sensors are integrated into the latest generation of accelerator pedals and electronic hand throttles, which convert the angle of the pedal plate or the rotary handle to an electronic signal. This way the signal can be sent directly to the control unit without loss. The sensor technology used for AB Elektronik accelerator pedals is contactless. Two types of contactless technologies are available; HALL and AUTOPAD® technology. AUTOPAD® is a company-owned technology. AUTOPAD® uses a contactless inductive approach, and is operated with a static and dynamic element. Additionally, there are contact technologies – potentiometers – in use. In all cases, signals are transferred very rapidly, with stability and high accuracy, fully satisfying the requirements of cutting edge vehicles. The majority of the pedals designed by AB use the reliable Autopad® technology, a patented internal development which has already been proven a million times over, and is also integrated into chassis applications, further underlining the robustness of this product and design. Autopad® operates inductively. The required assembly space needed is compact compared with other systems and can be integrated easily into the pedal housing. The EMC immunity and signal quality meet the highest levels in our premium customers’ applications, and allow very efficient individual customer designs. Electronic Accelerator Pedals by AB Elektronik are distinguished by their electronic design and high flexibility in special customer applications for the car market. There is also a proven portfolio for truck design and two-wheelers, in series production for market leading OEM´s. 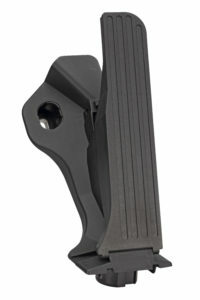 AB Elektronik manufactures more than four million accelerator pedals and hand-throttles for the global market each year. The portfolio of customer specific designs is built on a basic pedal design that can be cost effectively upgraded to a customer design.